Ray blight, caused by Phoma ligulicola var. inoxydablis, is the most damaging disease of pyrethrum (Tanacetum cinerariifolium) in Australia. 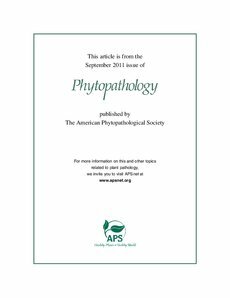 Data collected from 72 plots in commercial pyrethrum fields since 2001 to 2009 revealed substantial annual variations in isolation frequency of the pathogen during semi-dormancy of the crop in autumn and winter. Isolation frequency of the pathogen during this time and subsequent outbreaks of ray blight in spring were similar across the eight production regions where sampling was conducted, and isolation frequency of the pathogen was linearly correlated (r = 0.88; P <0.0001) with subsequent defoliation severity when plants commenced growth in spring. Isolation frequency and defoliation severity also were correlated with the incidence of seed infested with P. ligulicola var. inoxydablis (r = 0.71 and 0.44, respectively; P <0.0001 in both correlations). Highly accurate risk algorithms for the occurrence of severe epidemics of ray blight were constructed using logistic regression. A model based solely on isolation frequency of the pathogen over autumn and winter correctly predicted epidemic development in 92% of fields. Another model utilizing the incidence of infested seed and rain × temperature interactions in early autumn (austral March and April) and late winter (austral June and July) had similar predictive ability (92% accuracy). Path analysis modelling was used to disentangle interrelationships among the explanatory variables used in the second logistic regression model. The analysis indicated that seedborne inoculum of P. ligulicola var. inoxydablis contributes indirectly to ray blight defoliation severity through directly increasing overwintering frequency of the pathogen. Autumn and fall weather variables were modelled to have indirect effects on defoliation severity through increasing overwintering success of the pathogen, but also direct effects on defoliation severity. Collectively, the analyses point to several critical stages in the disease cycle that can be targeted to minimize the probability of regional epidemics of ray blight in this perennial pathosystem.